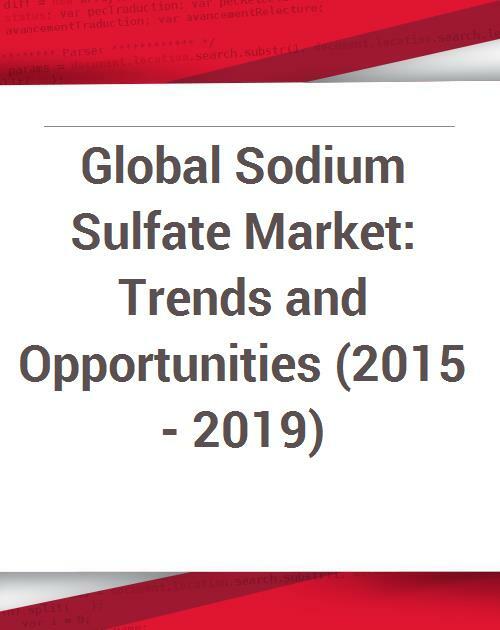 The report “Global Sodium Sulfate Market: Trends and Opportunities (2015-2019)” analyses the potential opportunities and trends in the global sodium sulfate market. The market size and forecast in terms of value and volume for global market has been provided with a market outlook for the period 2015 to 2019.The report also provides detailed global analysis of sodium sulfate average prices along with the demand and supply balance. The market production capacity on the basis of both countries and players is provided along with the world natural reserves of sodium sulfate. The report also provides detailed analysis of countries. This segment of the report provides the detailed analysis of the U.S. sodium sulfate market including sodium sulfate market volume, trade and market by application along with Europe sodium sulfate market by application. In the market dynamics section the report provides the detailed analysis of growth drivers, challenges and market trends of the global sodium sulfate market. This report profiles global sodium sulfate market, discussing market trends through 2014. The report also highlights leading players in the sector including Alkim Alkali Kimya, Industrias Penoles and Nippon Chemical Industrial Co. Ltd. on the basis of attributes such as company overview, financial stability and business strategies adopted to ensure growth, sustainability and increase in market share. - Nippon Chemical Industrial Co. Ltd. Sodium sulfate was discovered by Johann Rudolph Glauber. Sodium sulfate is neutral and does not hydrolyze in water. The solubility of sodium sulfate increases sharply with temperature and achieve maximum solubility at around 33°C. The anhydrous salt readily adsorbs moisture in air to give the efflorescence decahydrate crystals. It occurs naturally in the form of mirabilite and thernadite. The thernadite is usually deposited as an evaporation product near playas and salt lakes. It is also produced industrially by the reaction of magnesium sulfate and sodium chloride in solution followed by crystallization. It is used as a raw material for production of various products in industries such as: detergents, glass, paper and textile industry. It is also used as an ingredient of stock foods and remedies, in manufacturing of inks, in tanning of leather and in the manufacture of synthetic sponges. The global sodium sulfate production capacity is largely governed by China followed by Spain. Spain is the largest producer in Europe, followed by Turkey. The U.S. and Russia are the other largest sodium sulfate producers. European sodium sulfate market also plays vital role in the global sodium sulfate market as Europe also has significant share in the global production capacity. In Europe, detergent industry is the largest consumer of sodium sulfate followed by chemical industry, glass industry, textile industry and paper industry. The major global players in the sodium sulfate market are Hongya Qing Yi Jiang, Hunan Xinli, Nafine Group, Jiangsu Yinzhu and China Lumena headquartered in China along with Alkim Alkali Kimya headquartered in Turkey, Industrias Penoles headquartered in Mexico and Nippon Chemical Industrial Co. Ltd headquartered in Japan.